A wise man once said everything I need to know I learned in kindergarten. Well I don’t really know who said it and it does seem like cheap bumper sticker philosophizing but I recently realized there may be some truth to this statement. You see I’m one of those people that believes that there are events in our lives that deeply impact the formation of our values and beliefs without us being aware of it. The little things we hear and observe that we initially don’t make too much of but wind up being important touchstones in our development as individuals. There are two such events in kindergarten that I believe were keys in shaping my personality and leading me down the path I chose. The first one was my placement in the “Elephant Group”. Before I go any further I have to say I am not angry at my kindergarten teachers nor do I think they traumatized me any way. As a matter of fact I think they were great people. However my placement in the elephant group had to do with the fact that they might of the thought I was a little slow or different because the kids in the other groups had cool names like the lions or owls but I was an elephant, a big dumb elephant. Truth be told I kind of liked it because we mainly got to do a lot of art and play with the blocks. But it also helped me realize that I was different and I embraced that fact-I was a bit of a misfit from the get go. As it turns out I wasn’t really slow just a little awkward and by the end of the first grade I made my way into the Blue Birds-the highest reading group in the class but I still felt different and I was cool with that. The second circumstance is the fact that my favorite song in kindergarten was “This Land is my Land”. Every morning we would recite the pledge of allegiance and then chose a different patriotic song. I always chose This land is my land. I loved that damn song. Maybe it was the simple little tune or the fact that you pointed at your friends during the chorus. Who knows but I loved it. So what the hell does this have to do with Punk rock. 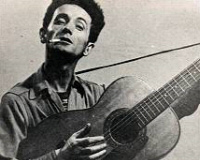 Well many years later I discovered that song was written by Woody Guthrie, the great folk singer, activist rebel, and quite possibly the true godfather of Punk. That song was an anthem of inclusion and acceptance, no matter who you are there’s room for you here. Now obviously I wasn’t aware of all of this as a five year old, that would make me one down right pretentious kid but there has to be some reason why that song always resonated with me. Then about a week ago I was watching Fuel TV and Mike Vallely is showing off one of his decks with the slogan “This Machine Kills Fascists” inscribed on it the same quote that Woody Guthrie scrawled on his guitar in the 1930’s and ‘40s. It hit me like a lightning bolt and it all made sense. Sometimes you chase your influences and sometimes they slowly, subconsciously shape your character and help form your ideals and when you get older you are able to connect the dots. I always knew there a was a reason I loved that damn little folk song. here endeth the lesson.